Hose is vital in firefighting, in most cases it’s the only way to get the “wet stuff on the hot stuff”. 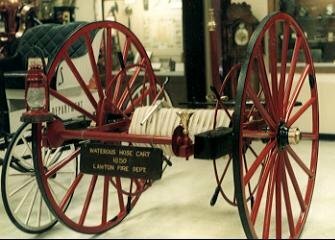 The early volunteer engine companies of the VFD had members equipped with hand-drawn reels (“jumpers”) and responded to a fire alarm at the same time as the engine. At this time all apparatus was hand-hauled and the riveted leather hose was too cumbersome and too heavy to be carried on other apparatus. Large wheels were necessary to cope with unpaved, rutted roads and could be hauled more easily and faster than if they were smaller. Long tow ropes and harnesses enabled hose teams to get the hose to the fire quickly. Hose could be laid quickly from a reel of this type. Changes in apparatus meant an end to front-line use by the 1880s and the hand-hauled hose reels were largely relegated to newly-established volunteer companies, or were retained for use in competitions. Some hand-hauled hose reels survived into the 1950s and even later, in some instances, in industrial firefighting. Though much smaller, they were essentially the same.